Two Saturdays ago, I attended the SF Thomassons Performance Tour, a collaboration by Kearny Street Workshop and Kaya Press that paired live performance art and installations with examples of hyperart, otherwise known as Thomassons, around San Francisco. The tour was inspired by the book HYPERART: THOMASSON by Japanese conceptual artist and writer Akasegawa Genpei. Genpei and his colleagues began discovering instances of architecture, structures and objects that exist (or persist) outside of the original intended function, such as an inaccessible door leading out of an upper floor of a building, or a staircase leading to nowhere. Gempei named these objects “Thomassons” after the baseball player Gary Thomasson (incidentally, a member of the 1978 World Champion New York Yankees). Thomasson was recruited by the Yamamuri Giants and apparently paid quite well, despite the fact that during his tenure his bat almost never made contact with a ball. In addition to publishing an English translation of the Genpei’s book, Kaya Press maintains a Thomasson website that allows people to upload examples from around the world. We at CatSynth have actually presented several Thomassons in our Wordless Wednesday photographic series, including these stairs leading into the San Francisco Bay. Our tour started at the Mint Mall in SOMA (South of Market). 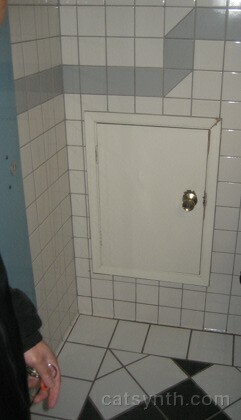 In the men’s bathroom in the basement, we were introduced to our first Thomasson: a small door in the wall of one of the stalls. The door purportedly opens to nothing, and contains nothing. Of course, we had to open it to make sure. It turns out that the door was not quite empty after all, and actually contained artist (and model-turned-actress) Philip Huang, who emerged bearing sake and assuming his role as host for the remainder of the tour. We then boarded the official tour bus and proceeded to our next stop, the 3rd Street drawbridge (not far from AT&T Park), for a performance of a “living sculpture orchestra” by artist Anthem Selgado. 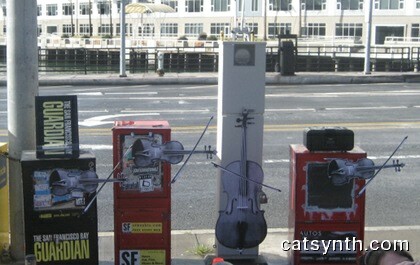 In this piece, the familiar boxes for dispensing weekly newspapers become the members of a classical string quartet. The 3rd Street drawbridge crosses Mission Creek, you can see some previous photos from nearby sections of the creek here and here. Our next stop was along 16th Street in Mission Bay (near the new UCSF campus), where a series of rusting pipes rise from the sidewalk. 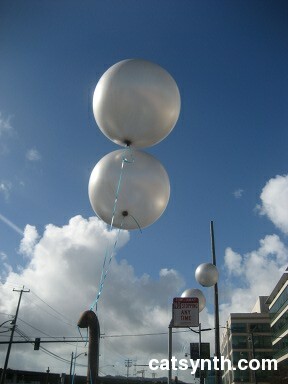 A sculpture and performance, again by Anthem Selgado, consisted of large balloons tied to the pipes. One set of balloons was attached to an old tape recorder with clips from the infamous “Balloon Boy” incident. The balloons (along with the Balloon Boy and family) were set aloft and last seen drifting towards the Pacific. En route to the next stop, Philip taught us the Korean rabbit song “San toki toki…” complete with choreography. We next found ourselves in a warehouse-heavy section of the Dogpatch neighborhood (not far from Pier 70), standing outside a loading dock that really no longer is a loading dock, given that it is completely blocked by plywood. This site served as stage for a dance/movement performance by Christina Miglino and Adderly Bigelow. Although the piece contained moments of bold movement, I particularly liked this moment of stasis, with both dancers balancing against the former loading dock. With their pose and dress, they seemed to become architectural elements of the site itself. We then moved on to what was advertised as “the largest Thomasson in San Francisco”, the former St. Joseph’s Church at the corner of Howard and 10th streets in SOMA. The church building has been vacant and closed for quite some time, although the gardens are still tended. Whether or not an entire building can count as a Thomasson was a subject of some discussion on the bus. Nonetheless, the next performance was in an alley behind the church grounds, and featured Rob Trinidad as a priest inviting the audience to confess their sins. Our final stop was in the Mission, at the site of some large unused beams jutting out from the back of a warehouse – actually, this was the back side of the building complex housing Cellspace. Kennedy Kabasares, an aerial artist specializing in static trapeze made good use of these beams with his impressive aerial choreography and gymnastics. Although the tour officially ended at this point, there was one more “bonus” stop that took us across the city to Crissy Field in the Marina District, not far from the Golden Gate Bridge. Here we found ourselves in the midst of a large pro-life rally and were treated to an impromptu performance of Philip “testifying”. You can see the full video here, or in the clip below. Incidentally, I think that is probably me shouting “l’chaim” at the end of the video. Our actual destination was the Wave Organ, a sculpture along the waterfront where the action of the wave interacts with a series of pipes to produce very musical sounds. Although the pipes and architecture of the Wave Organ suggest a splendid ruin, this is a fully functional piece of architecture and thus is not technically a Thomasson. But it did make for a nice coda to the afternoon. Look for an image of the Wave Organ to be featured in our upcoming Wordless Wednesday photo. 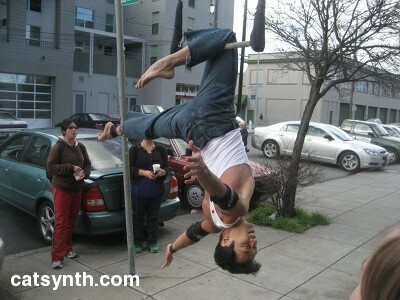 Posted on February 2, 2010 January 12, 2011 by catsynth	This entry was posted in Art, Reviews, San Francisco and tagged adderly bigelow, akasegawa genpei, anthem selgado, christina miglino, kaya press, kearny street workshop, kennedy kabasares, KSW, philip huang, rob trinidad, thomasson. Bookmark the permalink. That looked like s fun tour ! !